(v. 13) But this one thing I do: forgetting what lies behind and straining forward to what lies ahead, (v. 14) I press towards the goal for the prize of the heavenly call of God in Christ Jesus. Most, if not all, black churches have “Watch Night Services” on New Year’s Eve. The service usually begins around 10 p.m. and lasts until after midnight. For some black Christians this service is the precursor to a full night of New Year’s celebrations, but for others the service serves as the only demarcation of the coming year of new possibilities. As a pastor, I have noticed that the current job market and our economy are causing many Christians to become disheartened and emotionally weary. While writing this commentary, I was confronted by several parishioners who were facing unemployment, losing their homes due to the mortgage crisis, ill without health care, and living off of their savings that were dwindling fast. Although the church I serve is nestled within one of the wealthiest communities in the United States, Newton, Massachusetts, we are just a stones throw away from downtown Boston, which contributes to our wide array of congregants in varying financial positions. On any given Sunday, some of the nation’s top Harvard scientists and professors are seated next to homeless persons and recently released brothers from our state prisons. During services such as Watch Night, the congregational diversity is even more intensified. I write this commentary with a mental picture of the faces of possible persons who will be seated in my congregation on New Year’s Eve dealing with these types of economic concerns. As a homiletician, I always seek to interpret Scriptures through a literary and historical lens to addresses the soci-economic issues of the immediate context of my parishioners. My goal in this commentary is to encourage persons to persevere, using the memories of their past experiences amidst the challenges of their present situations, to press towards the prize of the personal freedom that is in Christ Jesus. 2. It lets us know that Paul writes about pressing towards a goal while he is imprisoned at Rome. This could serve as a great preaching point because although Paul is in prison he strains forward with the hope that something better lies ahead for him. This point also ties well into the context of the history of Watch Night because the enslaved Africans who were, for all intents and purposes, imprisoned in America, always pressed towards the common goal of freedom even though there seemed to be no escape in sight. Thus, we can encourage those persons who are listening within our pews to press towards the goal of economic stability in the face of a failing economy. However, a question remains, What does it mean to press and what realities are created when an individual conspires with the Spirit of God to change their present situations? I believe the answers are as follows: Pressing is the process of determined endurance. The word “press” here denotes a sort of chasing or swift pursuing. The NRSV uses the word “strain,” which means to stretch out for something. The image that my Pastor/Father in ministry, the Reverend Edward Spenser Reynolds, often used to explain this text was that of a runner who is near the finishing line giving it all that he’s got to finish the race. Thus, when we are at our “wits end” and feel as if the sun is setting on our race, the idea of pressing and cultivating an attitude of determined endurance may be the very thing that pushes us to win in the end instead of giving up in a difficult moment. However, pressing is very difficult in moments where everything seems to be against us—for runners it may be gravity and wind that is against them; for Christians it may be economic circumstances. Nonetheless, the text gives the reader two ways to ensure that he or she continues to press: (1) to forget what is behind you while pressing, and (2) to strain forward with a goal in mind. It is important to never limit yourself based upon the mistakes and occurrences of your past. If a runner is singularly focusing on her or his previous defeats while running a present marathon, the mental stimulation of failure will invoke a present recurrence of a past defeat. Let me take a brief turn here and address a few contemporary aspects of this biblical text. How might this text prompt contemporary individuals and communities to behave differently? What themes or elements from this text potentially inhibit or support justice or injustice and peace or violence? Seek to assist those who were incarcerated and are trying to re-establish themselves in a culture that often blocks all doors to them before they begin. These are examples of goals that a church could press for in the New Year. At the end of our pressing we will reach our goal. As a result of attaining that goal there is a prize, which is in Christ Jesus who is the personification of achievement in the face of obstacles. He pressed from the economic status of barnyard cradle and a rugged cross to receive the prize of resurrection after being imprisoned in the grave. He gained all of this because he strained himself on the cross and pressed towards his goals. We can do likewise, because he is within us, and Greater is the God that is within us than the evil forces that are within the world. As we await the New Year, behind us are all of its losses and even its victories. What remains ahead is the prize of the high calling of God in Jesus Christ. This is what we shall strive for, above all, in the New Year. Actions: Forgetting what lies behind, straining forward to what lies ahead, pressing on. Honesty with self: Paul looks forward in faith, but stands in reality. “Beloved I do not consider that I have made it my own, but . . .—this word in the English vernacular allows what is to come thereafter to triumph over what was stated before. Thus, although he has not laid ahold of the prize yet, because he is pressing and straining, he will. Sights: A person straining. The referencing in the text is to the Greek foot races, their finishing posts, and the award that went to the winner (Philippians 2:16; 1 Corinthians 9:24-27). 1. “A Watch Night Celebration: New Year’s Eve.” See Behold, a New Thing for “Ideas for Celebrating a Service of Watch Night; The Tradition of Watch Night; How to Explore Watch Night.” Online location: http://www.ucc.org/worship/worship-ways/pdfs/2007/07Behold-A- New-hing.pdf accessed 21 July 2011 See also Kachun, Mitch. 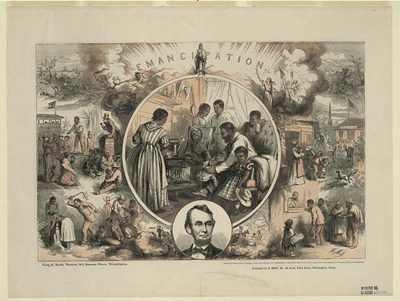 Festivals of Freedom: Memory and Meaning in African American Emancipation Celebrations, 1808–1915. Boston, MA: University of Massachusetts Press, 2003.; Williams, William H. O Freedom! Afro-American Emancipation Celebrations. Knoxville, TN: University of Tennessee Press, 1987.; Franklin, John Hope. The Emancipation Proclamation. Garden City, NY: Doubleday & Company, Inc., 1963; reprint edition, IL: Harlan Davidson, 1995. Also see the Cultural Resource unit for Watch Night 2011. 2. Seaver, George. David Livingstone: His Life and Letters. London: Lutterworth; and New York: Harper and Row, 1959. 3.Du Bois, W.E.B. “A New Year’s Prayer.” Prayers for Dark People. Amherst, MA: Univ. Mass, 1980.